When I started modding amps I set out to capture the tones of Carlos Santana, and Jimi Hendrix. It was mid-Seventies and Marshall was just releasing their first Master Volume model. The first Boogie hit the market, basically a more compact Fender Twin design with a single extra gain stage, and no channel switching. Hiwatt had their Harry Joyce preamp mod and that was pretty much it. That year I bought a 1969, 200 watt Marshal Major head from my buddy for $150. It was a PA head and I wanted a Lead model, so, I went to the distributer and bought some schematics. One mod followed the other and soon I was experimenting with channel-switching and FX loops. An FX loop is not for every type of device. Overdrive pedals, wah-wahs, phase-shifters, and compressor pedals sound better when used before the amp rather than in a loop. If however, you use a high-gain amp and wish to add a digital processor for reverb or delay then a loop becomes indispensable. Prevent distortion of digital reverb FX processors when using the preamps overdrive channel. Using reverb before your amp is the same as plugging the reverb into an overdrive pedal. When used in the loop instead, you can set the master volume of the overdrive channel to match the clean channel volume. This will deliver a more consistent reverb sound. Most modern amp manufactures cut production costs by using solid-state integrated circuits in both the Send and Return circuitry of the loop, even in their most popular "all-tube" amplifiers. This means that your painstakingly achieved tube tone is brought down to guitar level and re-amplified all the way back to power amp level by transistorized integrated circuits! And, to make matters worse, your guitar signal must go through this circuit even when you are not using the loop! I use an all tube design for the Send and Return loop circuits and install an additional 12ax7 tube to ensure that your tone in not altered. You can drive the FX level as hard as you want without worrying about transistorized clipping. I add an FX Return volume control so that you can drive the loop to whatever level is best suited for your FX and still have total control over the final volume of your amp. Low impedance loop Send will easily drive line inputs as low as 10k ohms without signal degradation or loss of high frequencies. -10dbm operation - compatible with both home audio semi-pro effects and stomp box pedals. For even more control I offer the option of separate series FX Loops for Clean and Overdrive channels. No need to switch effects when changing channels anymore, simply use different effects for each! Master override loop when not using individual loops still works in all channels when you don't want to use separate effects. The Solo Boost came about in response to requests for a slight increase in volume when doing solos, just a slight boost that could be controlled by a foot-switch. So that's what this is, an easy to control variable volume boost with no tonal change that operates on all channels. The air is saturated with radio frequency signals today. Cell phones, wireless internet, dimmers, neon lights all generate potential noise for your amp if it is susceptible to RF pickup. RF does not always manifest as an radio station, sometimes its a rushing white noise or a ground-like humming. Move the guitar cord up and down and left and right in the air. This noise can be completely eliminated! All my overdrive and FX loop mods are thoroughly insulated from RF noise. RF elimination does not affect your tone in any way but will really make things quieter. My favorite Tremolo effect is the Fender Princeton design. 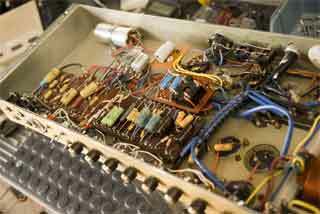 The tremolo is applied directly to the output tubes effectively switching the tubes on and off to generate the effect. Even when driving the amp into hard saturation the tremolo effect is not compressed or reduced. The tremolo effect is diminished when the amp is driven hard and the preamp becomes compressed. Everybody Loves this one. Convert your amp to Class A Cathode-Bias operation similar to a Vox AC30. Sounds fat and sweet, and more compressed, just beautiful with a Fender guitar. Want the original sound again? No problem, the ground switch is now the Class selector so flick it back to the amp's original Class AB Fixed Bias mode. 100 watt amps really benefit from this mod and will gain new life and bounce. No more need for a compressor on the clean sound.